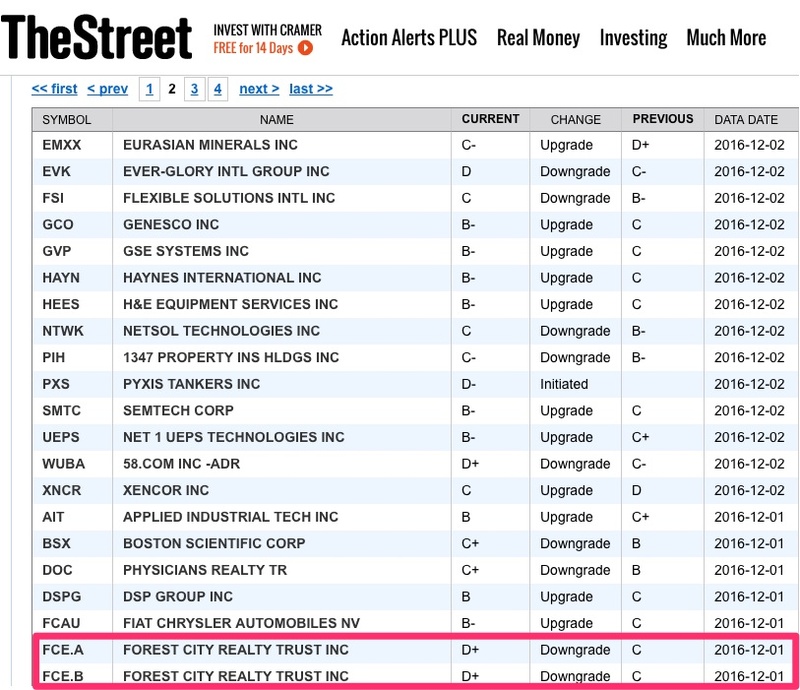 Some six weeks after the controlling Ratner family rejected a plan to change the dual-class stock structure of Forest City Realty Trust--which investment analysts, corporate governance experts, and activist stockholders have criticized as avoiding best practice and contributing to a lower stock price--the family reversed itself yesterday. Notably, Bruce Ratner, Chairman of the Brooklyn-based subsidiary Forest City Ratner, is stepping down from the parent's board and, unlike his cousin Chuck Ratner, who's stepping down as chairman, got no praise from the company. Bruce Ratner's spot on the board, to be taken by an independent director, will help tip the board to non-family control. The headline on the press release was Forest City Enters into Agreement to Eliminate the Company's Dual-Class Share Structure; Announces Board Changes and Corporate Governance Enhancements. On board was Scopia Capital Management, which (as the Plain Dealer noted) owns 8.4% of FCRT's Class A shares, and surely wants to see the value unlocked. 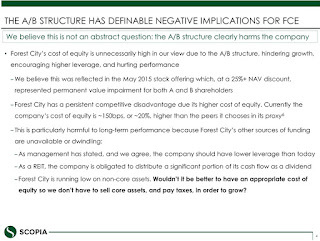 Scopia titled its August 2016 critical presentation "The ABCs Of the Dual-Class Structure at Forest City: Towing an Anchor." 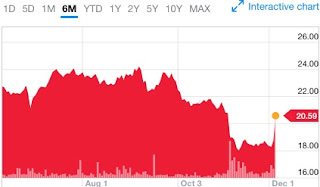 Forest City's stock went up 9.81% yesterday, but, as shown in the chart at left from Yahoo Finance, 10%, that only partly recovered from the loss that occurred after Forest City announced a $300 million impairment, mostly on Pacific Park. The press release was silent, but I have to believe that last month's announcement was a factor. 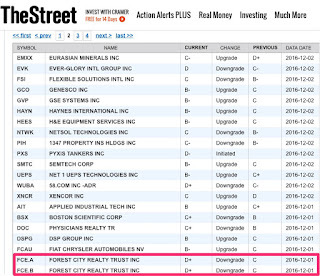 Also, TheStreet.com on 12/1/16 downgraded the stock (see below right) from C (hold) to D+ (sell). 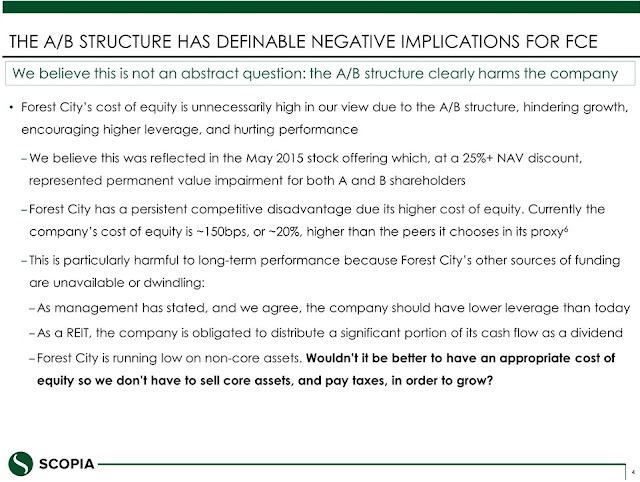 Yesterday, in response to Forest City's announcement, Citigroup upgraded Forest City from neutral to buy. Under the proposed reclassification, shares of Forest City's Class B stock, owned by the extended Ratner family, would be exchanged shares for 1.31 shares of Class A stock. Shareholder approval is expected, as the Ratner family, and Scopia, have signed on. In a joint statement, Chairman Chuck Ratner along with Scott S. Cowen, Chairman of the Special Committee set up to evaluate the change, said, "Eliminating the dual-class share structure is an important step in Forest City's continued evolution. After carefully reviewing the Company's options to further enhance value for shareholders, we determined that now is the right time to collapse the dual-class structure." That doesn't explain why it wasn't the right time six weeks ago. Chuck Ratner will retire from Forest City at the end of this year, after 50 years of service, and will step down from the Board; he said he'd always aimed to retire at age 75. FCRT President and CEO David LaRue saluted him. He will be succeeded by cousin James A. Ratner, now Executive VP of Development, as non-Executive Chairman, and James Ratner will give up his management job. Also, in full: "The Company also announced that Bruce C. Ratner, who has served as a Director since 2007, will also step down from the Board by year-end. Bruce Ratner will continue in his role at the Company's New York subsidiary."